Taiji Ishimori, and Hi69 (front 2 on right) pick Rionne Fujiwara as a partner as they begin thier journey into the Junior Heavyweight tag title scene to battle Hayata, Yo-Hey (front 2 on left) and their chosen partner Tafasuke in a very fast, and hard hitting bout that ends in a 15 minute time limit draw! In a short match (under 10 minutes) the ever popular Yone takes care of the over matched Saito. 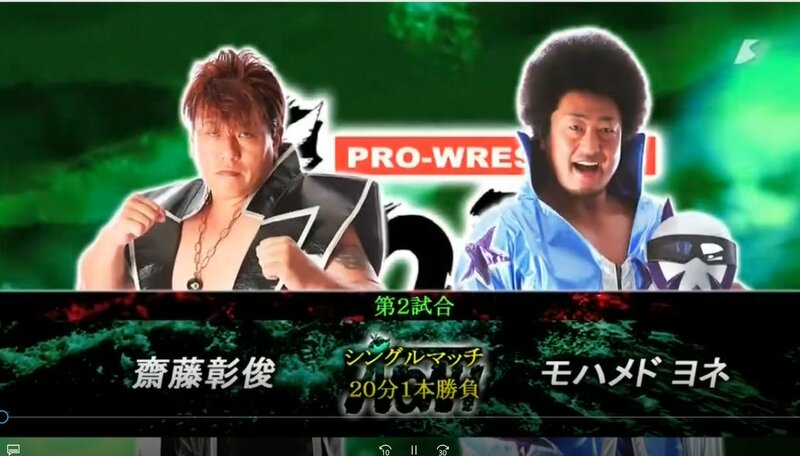 Both guys don't seem to have a true focus, but this match showed that Yone is clearly the better wrestler as he picks up a fairly easy victory. In Noah's Battle Royal's you are eliminated by getting pinned. 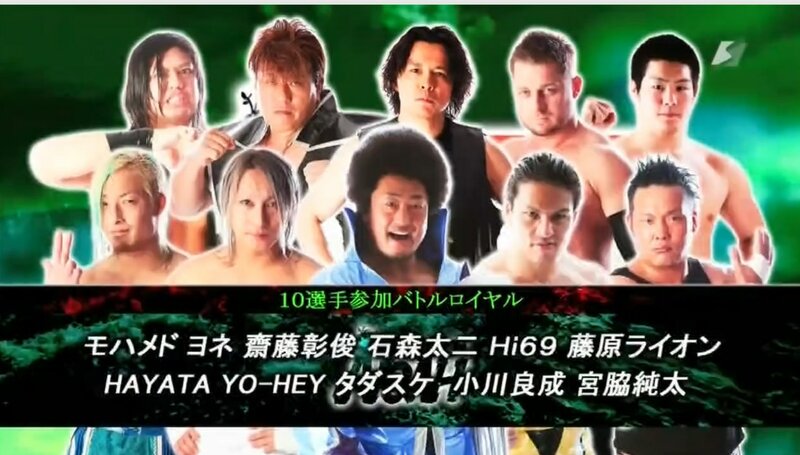 This bout was very quick for this style of match up and it saw YO-HEY (second from left front) pick up the victory via pin-fall on Ishimori as he rolled him, and Tadasuke up at the same time immediately after Ishimore pinned Tadasuke. These two, formally knows as "Momo no Seishun," a very successful Junior tag team, faced off in a very emotional battle as Kotoge recently vacated his Junior singles and tag titles to enter the heavyweight division. These two former partners spend the first moments of the match chopping each other, and laying in strong forearms blows to the head trying to prove who is stronger, and more in control. Harada doesn't like the idea that Kotoge is "leaving him behind" in the Junior Heavyweight divison. As such, Harada takes the match to the outside and turns the match into a fight with chairs, stacking them all over the floor and suplexed his friend and partner onto it. Harada's aggression didn't pay off in the end of the new heavyweight gained control, and won the match. Ohara, the new Junior Heavyweight Champion, and one of the hottest performers in all of wrestling as of late took on a man that has been getting more and more aggressive. Kenoh is on a mission to prove that he is a serious player in the heavyweight division, and while he respects and and all opponents he wanted to send a message in this match and he did so at Ohara's expense, leaving him lay at his feet after a sound victory, and then draping his championship belt across his fallen body. An amazing match, possibly match of the night. Two of the top stars in NOAH team with the two hottest up and comers in a fierce tag team match. 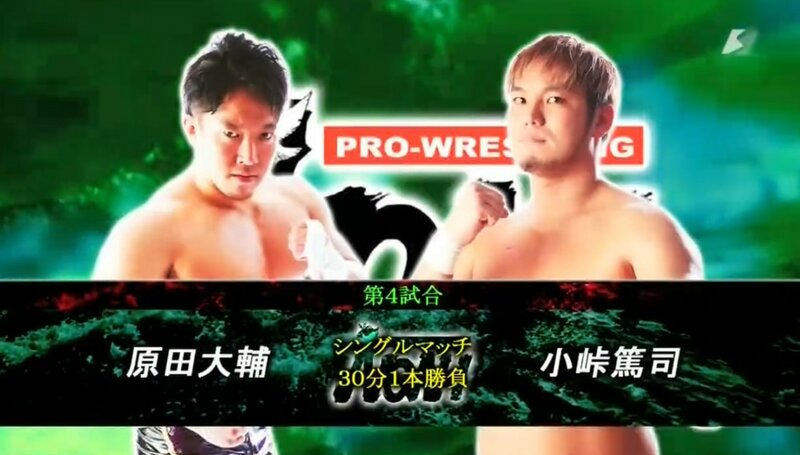 Kiyomiya joined forces with Sugiura several weeks ago, but the more upstanding Kumano refuses to ever go that route and instead teams with the "ace" of NOAH, Marufuji in an excellent match up that saw Marufujo pin Kiyomiya. At that point Keiji Mutoh appeared and announced that he will be teaming with Marufuji at the Yokohama show! 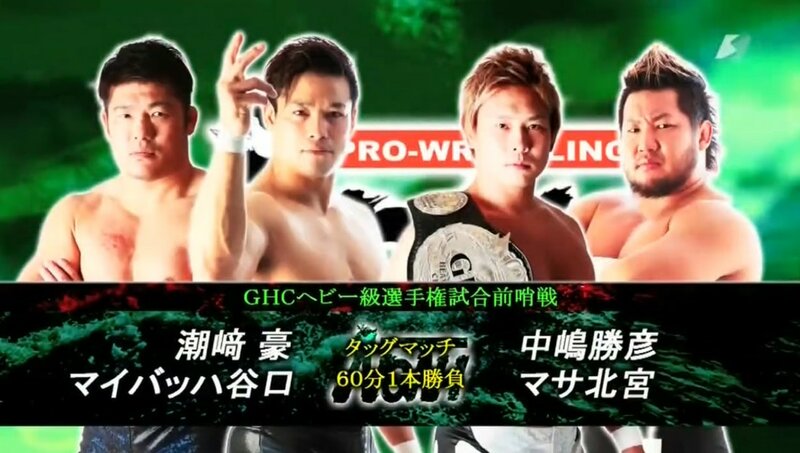 The GHC Heavyweight Tag champs, lead by Go Shiozaki (second from left), the new number one contender to the GHC heavyweight championship held by Nakajima (3rd from left) would face off in this tag match as Go's partner, and 2nd half of the championship team, Taniguchi (1st on left) and former number one contender Masa Kitamiya joined in for a terrefic main event that saw the Heavyweight champion, Nakajima, pin Go's partner, Mayback to win the match. 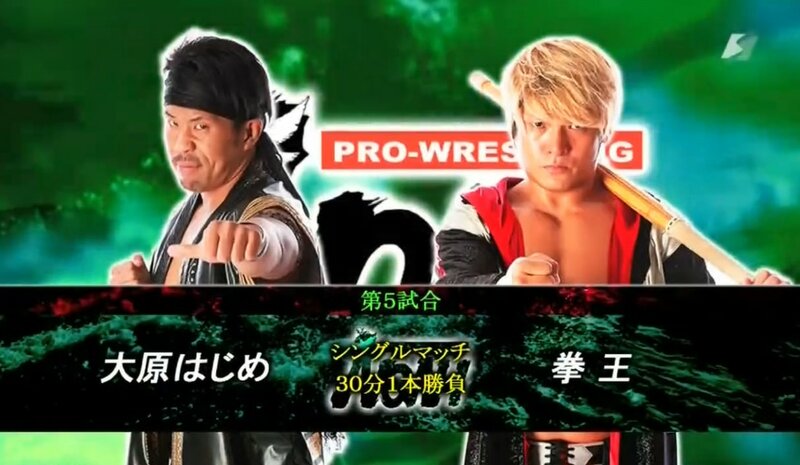 Nakajima then asks Shiozaki if he is sure that he's ready for a heavyweight title shot...as these two will face off for the title the next time it is defended.